This industry spotlight highlights the research we've done within the metals M&A industry and highlights how the deal activity in the last few years has affected current market trends. Interested in seeing the numbers? Sign up for our Machining and Metals Fabrication Newsletter today! We'll also sign you up for future updates. 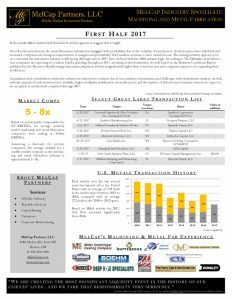 Recent metals transaction history in the U.S.
Want to learn more about our thoughts on the future of the metals M&A industry? Download our newsletter today!